NAIDOC Round in the WAFL has become one of the most looked forward to events every season and it takes on greater significance for Swan Districts because of the club's history of Indigenous players and work done with the youth both locally and throughout the Pilbara. Claremont and South Fremantle might have been the two WAFL clubs to get the annual NAIDOC Week fixtures up and running over a decade ago, but it's become a league-wide event since and Swan Districts is at the forefront of that. 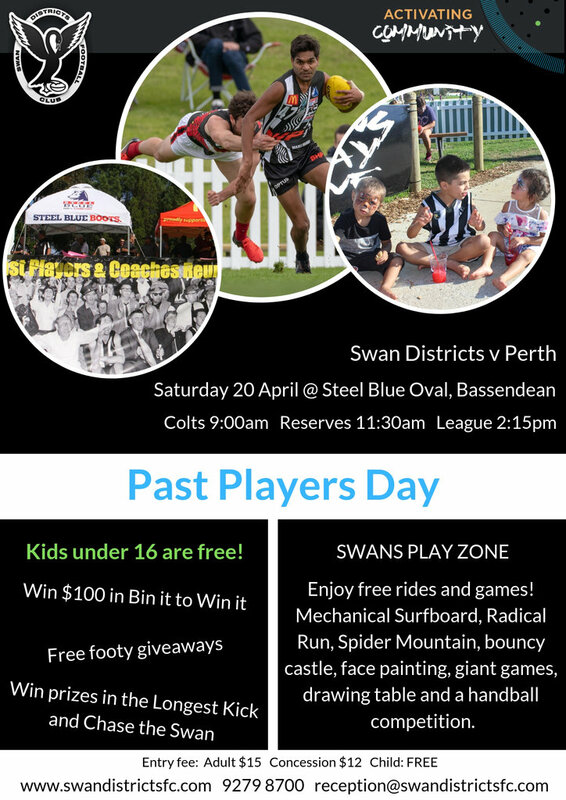 This Saturday, Swan Districts will host Perth at Steel Blue Oval in a match between two clubs with remarkably rich histories of Indigenous players both past and present. Both teams will wear specially designed jumpers for the league match on Saturday and the Swan Districts jumper was designed by students in the Pilbara region. They came up with the design in recognition of the Swan Districts' regional zone. A big day is planned at Steel Blue Oval to celebrate the occasion with a Welcome to Country performed by local elder Robyn Collard which will feature before the men's and women's teams line up in their NAIDOC jumpers. A Marngrook (traditional Aboriginal) exhibition game, facilitated by the Shane Beros, will be played at half-time. Boomerang and Australian animal painting, mosaic flag making, and bracelet beading will be taking place in the Swans Play Zone. 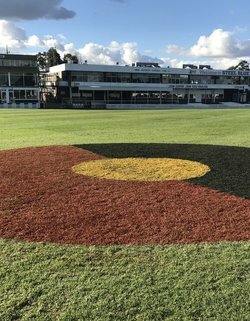 The celebration on the day for NAIDOC Round will continue to recognise the rich history that Swan Districts has with Indigenous players right throughout time. Phil and Keith Narkle are two of the all-time greats of the Swan Districts Football Club. Keith played in the 1982, 83 and 84 premiership hat-trick for Swans while Phil went on to play in the 1982, 83 and 90 premiership triumphs. Peter Ware (1983), Joe Ahmat (1984), Kevin Caton (1984) and Danny Penny (1990) are also premiership players while Andrew Krakouer, Graham Jetta and Michael Walters played in Swans' most recent premiership triumph in 2010. That was a remarkable season all round by Krakouer who would win the Sandover Medal, Simpson Medal, Swan Medal and lead Swans to the premiership before earning another opportunity in the AFL with Collingwood. Swan Districts has also produced Indigenous talent such as Jeff Garlett (Carlton, Melbourne), Neville Jetta (Melbourne), Walters (Fremantle), Lewis Jetta (Sydney, West Coast) and Chris Yarran (Carlton) who have gone on to have successful AFL careers over the past decade. Now heading into Saturday's contest with Perth at Steel Blue Oval, Warrick Wilson and Albert Dean are in line to play for Swan Districts in the league contest while Kirk Ugle and Taryce Stewart are among the other senior listed players at Swan Districts in 2018. It's fitting that Perth is Saturday's opponent for Swan Districts given its history with past Indigenous greats such as Barry Cable, Troy Cook and Leon Davis, and currently having exciting talent like Cody Ninyette and Michael Bennell in its line-up. But it's not just about players on the football field wearing the black-and-white jumper where Swan Districts is making its mark in terms of the Indigenous youth and communities throughout Western Australia. Over the past decade, the V Swans program has continued to grow from strength to strength taking pride in delivering high quality programs via high quality people. Aboriginal & Torres Strait Islander people , people from CALD backgrounds and women fulfil a significant number of roles throughout the V Swans program. Over the years, people the calibre of Chris Lewis, Peter Matera, Andrew Krakouer and Des Headland have been involved with the V Swans program. Currently, the program is overseen by Kara Donnellan with Cheryl Thomas the regional manager and Shane Beros high performance manager. Then there are highly-regarded regional managers throughout the state including Beau McDonald (Roebourne), Tracey Swami (Hedland), Paul Pitchers (East Pilbara) and Adam Conwell (Ashburton). Steve Thomson is also Kicking Goals program manager for the Hedland region while Callie Walker is Active Education development officer, Kaiden Matera program manager in Ashburton, Merle Ashburton Early Year program manager in Ashburton, and Bonnie Palmero Youth Centre co-ordinator. It is some remarkable work the V Swans program continues to do right throughout Western Australia in not only producing football talent that end up with Swan Districts, but also providing education, health and welfare guidance, programs and support to those who otherwise might not receive the support. 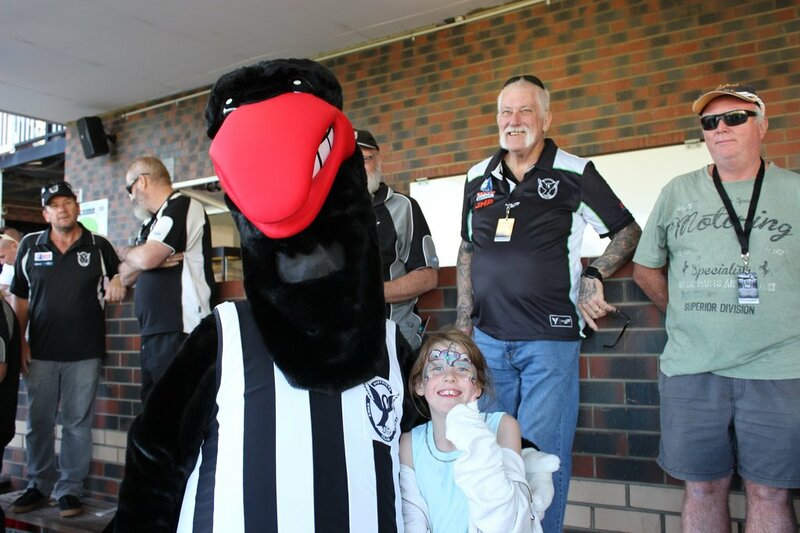 A lot of what the V Swans program does is much bigger than football and it's yet another reason why Swan Districts' continues to have such a strong connection with the Indigenous culture and why an occasion like NAIDOC Week deserves to be celebrated in style.